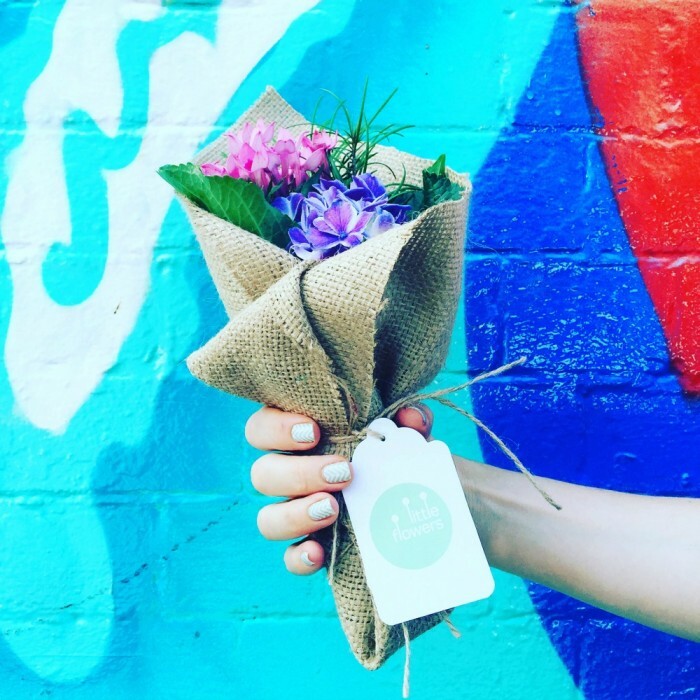 Remember that one time, Lisa and I spent a day discovering the Art of Kindness? 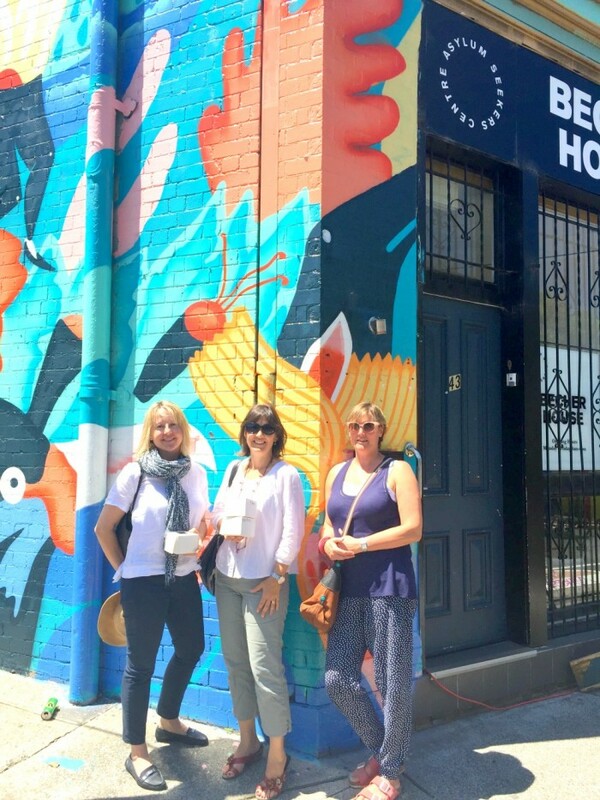 That was a very special day and one of the very special places that we visited was the Asylum Seeker’s Centre. Good things happen there. The centre supports clients with everything from casework, accommodation, financial relief, health care and counselling, employment assistance, education, nutrition and social support. Over the last 12 months, the centre has cared for 1,238 asylum seekers. 100% of those 1,238 people received no government support, not one cent. The clients come from 74 different countries and although they may be of different faiths, different colours and come from different places, the thing they have in common is that they are all searching for safety, protection and freedom, something that I think we enjoy (and take for granted) every day. 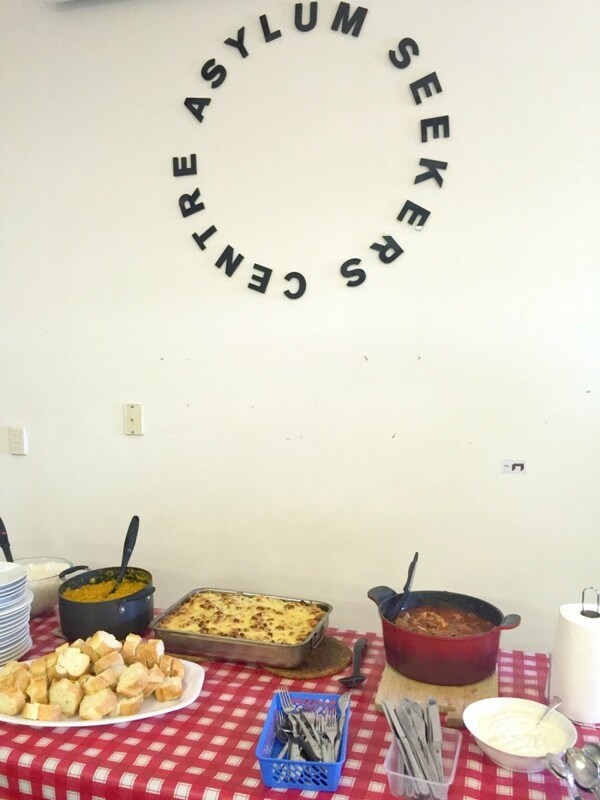 The centre is a not-for-profit organisation and relies on grants, donations and volunteers to undertake their work which is pretty amazing when you consider that last year they provided over 4,853 one-on-one job consultations, more than 8,760 hot meals and in excess of 7,777 food parcels. But that’s not all. They also provided over 12,000 casework hours, assisted with 31,632 accommodation nights, provided more than 713 legal consultations and over 3,293 health consultations. Anyways, it turns out my mate Nicky, along with a network of friends, have been volunteering at the centre for some time. Once a month they prepare and cook a delicious repast at home and then take it to the centre and serve lunch to the clients. It turns out that there is an army of about 150 volunteers just like Nicky and friends, who come to the centre and make sure that the clients get a hot meal every day of the week. That’s a whole lot of yum! The irony that neither me nor Nicky, nor Sheelagh nor Jeannie were born in Australia was not lost on us. We feel very lucky that we have so many choices and that we get to choose to call Australia home. Jeannie made an uber pasta bake, Nicky made a Chicken Casserole and I made Pumpkin Curry. For dessert, Sheelagh served a lorry load of fruit which I balanced out with some Choc Chip Muffins and Borrowdale Tea Bread. For many of these people, the centre, and in particular, the daily lunches are a real refuge, it’s a place where they can come to sit down and relax, feel safe and enjoy a good meal, another thing we get to do (and take for granted) every day. Lunch at the centre is a shared and unique experience. There were empty plates, smiles and even a thank you poem. My Pumpkin Curry pot was pretty much scraped clean and one of the clients told me that it was the best Pumpkin Curry he’d ever eaten, better even than his own, and coming from the Punjab, he’s a self confessed curry connoisseur! An Indian lady also sought me out when she learned I cooked the curry (actually the Thermomix did, but I’m happy to take the credit) she took my hands, looked at them, and told me I have “special hands” if I can make a curry like that. I make curry as good as an Indian person apparently – her words not mine! It seems the curry was a hit not just with the clients, but the “Pattie”s too, Nicky, Sheelagh and Jeannie (you know like Ex-Pats = Pattites) – everyone was begging me for the recipe. So seeing as we’ve shared lunch, shared the love, now let’s share the recipe and let’s all pumpkin curry like a boss! 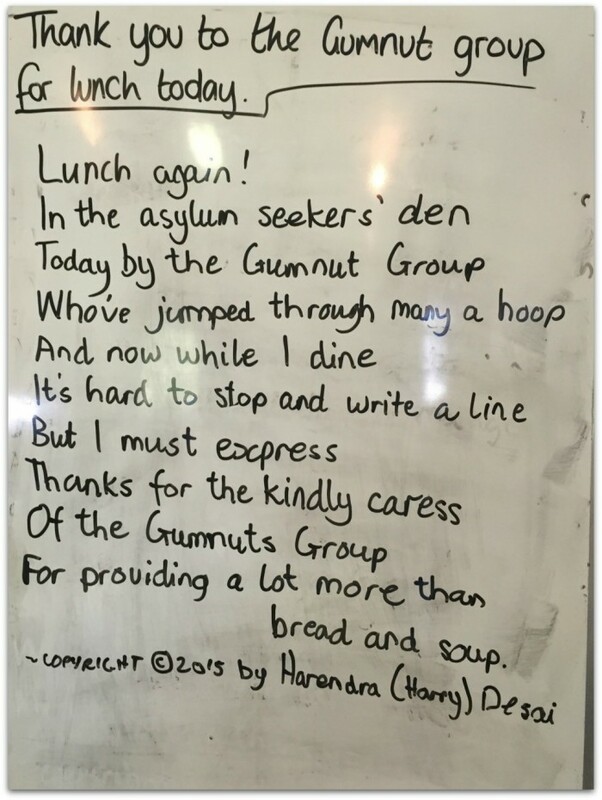 In the meantime, click here to find out how you can get involved at the Asylum Seekers Resource Centre. Because together we can make a difference. This curry is adapted from the Thermomix Fast and Easy Indian Cookbook and it tickles all the tastebuds. The level of spicey is nicey and the sweetness of the pumpkin really balances out the heat of the chilli. It’s super quick to make, really delicious to eat and freezes brilliantly. 1. Heat oil for 3 minutes on Varoma Temperature, speed soft. 2. Add the onion seeds and chillies straight away. Heat again for 1 minute on Varoma Temperature, speed soft. 3. Add onion and chop for 5 seconds on speed 4 1/2. 4. Scrape down lid and sides and saute for 10 minutes on Varoma Temperature speed soft with the MC off. 5. 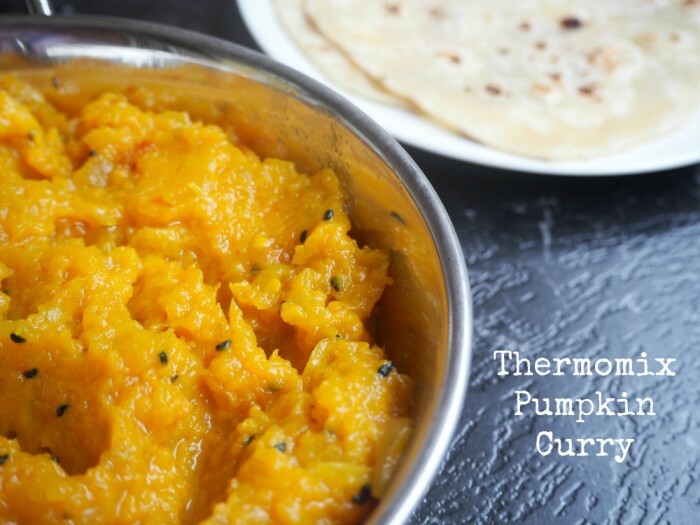 Add the pumpkin, turmeric, chilli and salt and cook for 5 minutes on Varoma Temperature on reverse speed soft. 6. Cook for a further 10 minutes on 100C on reverse speed soft with the measuring cup off. 5. Serve with some steamed rice or rotis and natural yoghurt on the side.